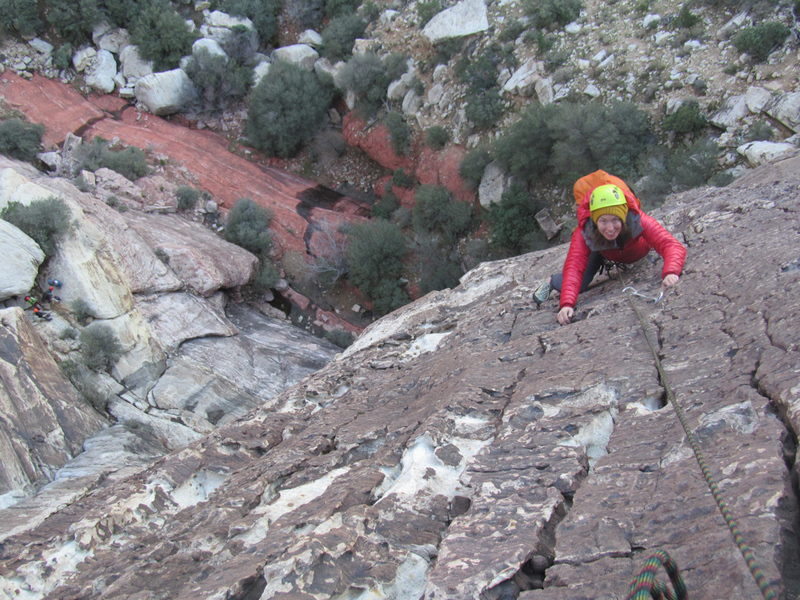 “What does one have to do to get in your blog?” John asks as we rope up below the Red Rock classic, Black Magic. It is early afternoon and the route is four pitches long. For me there is nothing extraordinary about this this moment – just another day in the life. Maybe it fits at the extra-ordinary end of the spectrum. Regardless of the moment’s location on the spectrum, this venture has all the makings of a blog post: good people, good route, and since John asked, I am thinking about it. That counts for something. Plus, we will likely be descending in the dark, but we have our headlamps. I guess that is a little less ordinary. The process is usually the same. There are things that happen, quotes that are said, or people who are met, that are memorable, or at least entertaining. I can usually identify something I want to commit to writing while it is happening or not long afterward. Climbing Black Magic with Ziggy and Jon would be a fine example. Things don’t always take the form that I initially thought they would, or even come to the fruition. The Dala Dala, for instance, is something I wrote mentally while I was experiencing my first ride. It was something unique, something different, yet finite. The Zanzibar beach vacation that I was on when I developed most of this post, while unique and finite, doesn’t lend itself well to me writing about it. Its broadness strikes me as too daunting. It is the small, day to day items, that will make it: the interactions at a bar, the making of a bed, the riding of a motorcycle that are things that could be written about from East Africa. Of course there are lists involved: topics I want to cover, unfinished pieces whose time has not yet come, and written pieces waiting for their right time. These lists are everywhere from the back page of a 2015 Patagonian journal to the Stickies app on my laptop to a note scrawled across the back of my hand. Generally, when writing a blog post a month (except when I am in Patagonia and the writing just seems to flow) sometimes I find the inspiration for new material is not always there. So I have an ever growing folder of pieces that seems to both provide inspiration and frustration. Sometimes these are things I have started months or years ago. They may or may not be complete, in fact, a majority are half-written, but often provide me with something to post when extra time for writing is lean or the inspiration has run dry. If I need inspiration, I need not to look far. Inspiration can come in my newly purchased home, it can come in the snorkeling on a reef or the ascent of one of the Seven Summits. It can come in the mundane or in the amazing, the ordinary or the extraordinary. The first time I ever went to Patagonia I thought it was a once in a lifetime trip. I have since been there eight times. And it still inspires me to write like no place else. Earlier in the day we hiked up to the Romper Room and did some top roping with the rest of the group. Graham and Greta had taken other students up Lotta Balls and Black Magic. Now we were waiting for them to return so we could use their ropes on our ascent. We had watched them scale the tiny knobs that dotted the sandstone face, then disappear from view into the lower angle terrain of the cliff’s top. Eleven, noon, and then one all came and went. Though it was getting late, I harbored little reservations about start times; headlamps and a big bright moon dulled my concerns. Eventually though, Joe suggested pulling a couple ropes and heading over to start up. He could manage the cragging and Graham or Greta would be back soon enough. I grabbed a rack from my pack, corralled Ziggy and John and we moseyed 100 yards to the base of the climb. They move fluidly and quickly through the middle two pitches however, and my arms fly as I reel in rope and coil it across my clove hitched tether. Below are laughs and smiles. The second crux, a bolt protected “roof” is smooth for them, though, like a rookie, I encounter a bit of rope drag as I reach the belay stance. John had me thinking about a blog post and I knew that there was something there, so the process was pretty natural. The next day found us waiting out the rain in a coffee shop in Vegas, so I pulled out my laptop and used the time to peck away at this keyboard, putting my tale of daylight ascents and nighttime descents down for posterity. Frequently though things happen a long way away from an internet connection, forcing me to blog in an analog format. Maybe I am in the mountains or desert; I frequently spend time without a laptop or word processing capabilities. So I grab a writing utensil and paper and start putting the written word down as it was envisioned thousands of years ago. Sometimes I find that easier than the idea of sitting in front of a blank screen, with a blinking curse-or. Ideas often coalesce for me while I am walking. Sometimes when I am driving. Then I work it over and over again in my head, trying to remember the details, the sentences, the way it is crafted. Maybe when I get to a less mobile, more hands free place, maybe by then it is committed to memory. If the road is a straight western highway, I have been known to write in my lap; notably The Something of Nothing was concocted partially in this way. Ultimately, I want the process to be simple. I want it to be a cliche. I want to sit by a table with an ocean view and white sand beaches and hear occasional chatter in a language I don’t fully understand. I want to sit by a white frosted window pane, looking out on a snow covered yard with a cup of tea. I want to be in an international airport terminal, with a table and a glass of beer, watching the world go by, typing, crafting and being inspired. I want a table, quiet, a drink and open space. I want a hardwood floor and a wood stove nearby. I want a space overlooking a stormy sea, with grey clouds hanging like clag over cold, dark water with whitecaps punctuating the endless expanse and the sound of the water crashing ceaselessly at the rocky shore. Again, now, as I plug another piece into this long stagnant post, the place inspires writing: I sit in a small tag along trailer parked in Indian Creek’s Super Bowl. It is January. Anna cooks pancakes, the sun slowly pushes over the eastern escarpment and my mug steams into the cool air. NPR plays on the radio, an interview about the writing process inspires me. So I pull out the iPad and start typing a few sentences. Place, process, the meta level. Sometimes the process looks like that, sometimes it is a cliche. Just because I am in it doesn’t mean it works though. Inspiration doesn’t come in those places, save maybe now, as I look out at a 100 meters of white sand beach stretching into the Indian Ocean. Because it is now that I sit in one of those places and reflect on the process and recognize my cliche. So now I write about the writing process. I write about how I have this ideal: this small house, a beautiful, inspirational space, and most importantly, time, yet I don’t feel the urge or the drive. The process works in reverse. What do I write about here? Do I dredge up more stories, older ones from the vault or do I look for new material, stuff that is surely out there, as I spread my footsteps across the globe? The process of this post has been lengthy. From the canyons of Red Rock National Conservation Area to Las Vegas coffee shops to a snowy afternoon at my dining room table in Wyoming to a studio apartment on the eastern coast of Tanzania to Indian Creek Recreation Area in Southern Utah to a southbound plane ride out of Denver, it has been worldly pondered and extensively drawn out. From February of 2016 through to the present, It has been looked at, added to, deleted from, set aside, questioned, and forgotten. Unlike the writings that so often emerge from Patagonia, it has been anything but quick and simple. We top out in the waning light and organize before starting our rappels. Ziggy hands me the coiled rope which I toss and watch them smoothly unravel into the darkness beyond my light. We rig our devices, rap, and repeat. Another toss, this one tangling not far down, still in the pale blue-white range of our headlamps. I rap first, deal with the tangles and find myself on a big ledge. Moonlight and headlamps reveal trees, and a small trail. 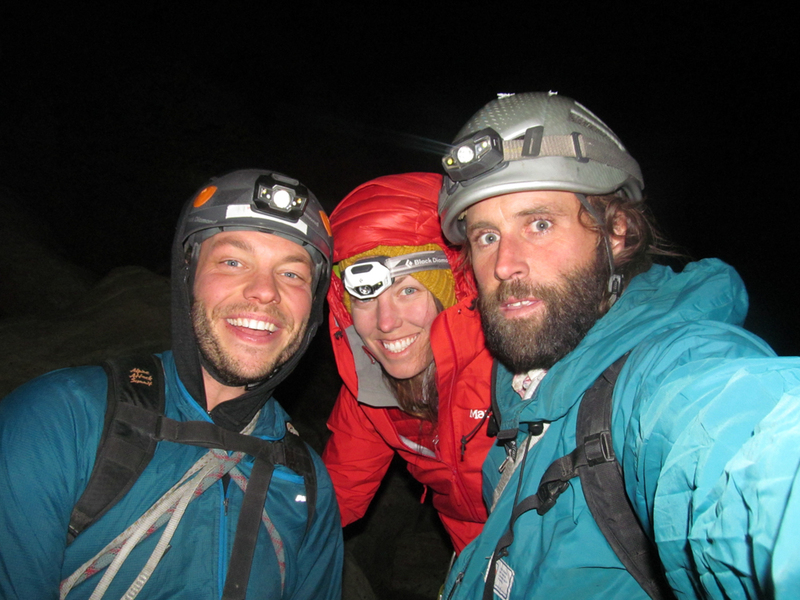 We down climb steepening terrain before making our way around the corner to our packs, sharing high fives all around. The moonlight walk out validates my choice or at least makes me not think it was a bad idea. We walk the well marked trail, the headlights out on the highway slowly getting bigger and brighter. Random lights off the trail are people burying bodies and flashlights walking up the trail, hooting at us are Joe or Greta looking for us. At least one of our suspicions is proven wrong as we run into a handful of teenagers. “Anything interesting out there?” one of the sweatshirt clad youngsters asks. His cohorts are swaddled in blankets and staring out at the moonlit mountains and dark shaded canyons. “Just what you see” I reply. “If you like exploring, then it is limitless” a reply is grunted and we push onward, visions of supper and beer pulling us homeward. Outcomes of the process vary greatly. Whether it is exactly as I imagined or heavily morphed, I usually only put something out for the world to see if I am satisfied with the product. This post doesn’t have the hallmarks of ones I feel super about, but it touches on how I work and what I think about, and I like when I can put not just my product to my audience, but also a bit of my inner workings. I had a professor while at university whose class was based upon Actions. Actions were graded based on three criteria: risk, rigor, and irrevocability. I didn’t think about it when I started writing blog posts, but doing so meets those criteria. The more I put of myself into it, the more risk I take; it’s more than just someone not liking my writing, maybe they won’t like what, or who, I am. The process is a big part of the outcome. I put rigor into something, working hard to create and in doing so it has become a part of who I am and how I put myself out to the world. I started this blog as a way to force myself to write more. jaredspaulding.com doesn’t receive the traffic of more high profile blogs and while I occasionally do check to see how many visitors my site has had, I continue to write because I enjoy the process. It puts me out there, makes me take chances and feel vulnerable. And my heart still flutters and gut still twists slightly when I click on “Publish”. Featured Image: Dusk settles in on the Las Vegas Valley.